Walkie talkies have become more common than ever as they’re a relatively cheap way to keep in touch quickly and efficiently. A large number of applications for these little radio devices such as shopping mall security or construction businesses is one of the defining characteristics of them. If you are interested in purchasing one, whether you’re going on a backpacking trip or need it for work, it’s important to make the right decision and take your pick from the best walkie talkies out there. Read my other articles on the best Bluetooth receiver and best cell phone signal boosters. This list brings together the most cost-effective two-way radios found on the market offering you a varied selection to choose from according to your needs. A few of them are intended for kids as they are very basic in functionality but there are also a bit more advanced units for more pretentious customers. The best walkie-talkies are those that give you a decent range to work with, are highly portable and have useful features like weather alerts, flashlights and more. Hopefully, with the help of this article, you will more easily find the right product for you. 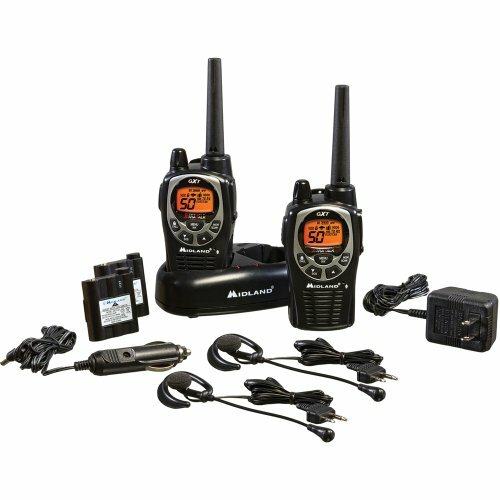 The rechargeable Proster walkie talkies add a solid level of convenience to communicate freely and connect with ease over a long range. It’s not every day when it happens to stumble upon such a balanced device feature-wise and within such a reasonable price bracket. Connecting with each other well relies a lot on the surroundings but Proster ensures a decent range of 2 miles that you can work with. Lots of sectors and industries can benefit from these handy devices to instantly communicate and a few examples are security guards, bikers, and construction workers. Digging a bit deeper into the specifications for this unit we can discover some nice stats. The frequency range of 400-470 MHZ UHF and the 16 channel memory are all decent values for a single band radio. DCS and CTCSS functions have been included by Proster to shield the walkie talkie from as much external interference signal as possible and to reduce the noise. An aspect that’s considered a very solid advantage offered by this model is the 1500mAh rechargeable battery coupled with a USB charger to keep the connection alive more conveniently. Most USB ports such as those from a PC or a car will charge the battery. In the case of emergencies and during nocturnal activities, the built-in LED flashlight might come in handy to navigate or to signal each others presence from a distance. Something that radio enthusiasts will love is that it comes with its own original earpiece for a loud and clear voice transmission and to guarantee private communication in any kind of environment. At the same time, it also does a good job at filtering out the background noise. The Proster 16 channel walkie talkie has been designed to meet the needs of many people looking for the quickest way to stay in touch over short distances. Because of a generous number of features and its reasonable price, this represents an ideal device for anyone looking for a reliable walkie talkie. BaoFeng’s BF-888S is very well received in the radio communications community. It has a lot of great qualities and is definitely one of the most cost-effective options for a walkie talkie. A decent little radio that’s incredibly simple to operate, the BF-888S by BaoFeng packs a lot of punch for the money. This transceiver is a Single Band, 400-470MHz, low power radio. It has a good receiving sensitivity and a decent selectivity. The lack of filtering might become a problem in RF areas that are heavily congested but at this price, this is a non-issue. Support for CTCSS/DCS is provided as well as Channel Scan, all points in favor of the BF-888S. The sound quality is not amazing but considering the price it’s actually better than expected. BaoFeng tweaked the transmitter well, the audio reports are better than average and its 2W have the ability to get you around locally with ease. The package of the BF-888S contains a heavy duty belt clip, a basic English manual and a few other essentials like the 3.7V 1500mAh battery, a charger, and a UHF antenna. The latter comes terminated with an SMA Female connector, a very typical standard found among BaoFeng handhelds. The body of the radio is quite lightweight at 5.3 oz, reaching somewhere around 6 oz in total with the battery. On the top of the unit, you can discover the traditional switch for Volume/PowerOn and the one for selecting through 16 channels. On the left of the BF-888S, there’s a PTT switch, a monitor button, and a handy LED flashlight. Finally, to the opposite side, you’ll be greeted by the standard programming cable/speaker-mic connector. Getting the job done at a minimal cost seems to be the main focus of this walkie talkie. If you need any fancier features like high power, dual band or waterproof ability, you should probably look elsewhere but for basic functionality, the BaoFeng BF-888S has got you covered. Within a narrow radius, there aren’t better options for maintaining continuous communication than hand held transceivers such as the Retevis H-777. This one serves proper connectivity in a given perimeter and is loaded with great functions for enhancing the user experience. The unit feels very smooth to the touch and is so easy to carry you might even forget you have it with you. It has 16 channels with modifiable frequencies (UHF 400-470MHz) when connected to a PC and using special software for this purpose. One aspect that’s particularly attractive is the effortless operating process. There aren’t any difficult technical aspects that you need to go over before using it. Feature-wise, this radio can assist in your communications endeavors with ease thanks to the LED screen, a time-out function, and its handy alarms. A reasonably long battery life coupled with a torch light add to the value bundle represented by the Retevis H-777 walkie-talkie. With a decent output power of 3W and incorporating scanning and monitoring functions as well as TOT function, this lightweight device brings some quality assets to the table. In terms of sound quality, this device doesn’t disappoint as it offers a loud and clear sound without any noticeable interruptions. Many accessories such as additional earpieces play nice with this model. Without getting lost in too many technical specs, what really matters, in the end, is the way the radio works in practice. And the general impression is a positive one as this device offers a satisfactory experience delivering effective communication. Compared to many similar other walkie talkies, Retevis’ model seems to be quite promising in all regards. The one thing I would call a slight drawback would be the included earpiece which is not exactly of very high quality and can be unreliable at times. In the package, there’s a helpful belt clip for attaching the small radio to the waist or any other body location. There isn’t really much else to add but considering its price bracket, Retevis H-777 is performing decently for a walkie-talkie and with so many reliable features and a solid audio quality, it’s definitely a recommended buy. The Midland GXT1030VP4 has some advanced features and a very cool yellow design for high visibility. In the walkie-talkie world, this makes it stand out a from the crowd. Besides the different color, it comes with all the features loved by radio enthusiasts in the previous model. This consumer radio offers a lot of channels, 50 to be more precise, and a generous amount of 142 privacy codes to guarantee you’ll always have a private channel available. Many models on the market impose a limit by restraining individuals to only a few frequencies. Having more channels means you won’t be cluttered with all kinds of noises in the more congested zones. A great thing about this level of privacy is that you aren’t only protected from outsiders’ interferences but also from those in your own group. It allows you to make calls directly to any preferred individuals from your party so as not to alert everyone at once. To keep excess noise to a minimum, this unit has a vibration setting and more importantly, permits the users to engage in silent communication over a generous range of 36 miles. Midland added a bit of protection from the elements to the GXT1030VP4 as this radio meets the JIS4 standard which means it can withstand exposure to heavy rain for approximately 30 minutes. At this price, full waterproofing would have been nice but still, this remains a very capable Midland walkie talkie. Just don’t take it for a swim and it’s all good. Thanks to the weather scan feature, the device will seek the nearest NOAA broadcast to get the latest weather and hazard essential announcements. Besides weather alerts there are others too, a few notable examples are the Child Abduction, Nuclear Power Plant, and Biological Hazard warnings. A nice function which is not very often present on other models is the ability to send a distress signal during emergency situations. If you value a long range and advanced privacy settings more than anything then this one will fit you like a glove. It’s a bit bulkier than similarly-priced walkie-talkies but it’s a very performant and reliable radio that represents a very solid investment. This Midland is highly recommended if you are searching the market for the best walkie talkies. Walkie talkies for kids have recently experienced a surge in popularity and the reason for that is simple. They are a fun way to keep in touch with your children during any outdoor activity or nature expedition. Floureon offers a stylish solution in the form of a portable toy radio transceiver for the benefit of your kids. With the help of these devices, you can stay in contact in a reasonably good range of generally up to 3 km but for open fields, the range can also reach around 5 km. They can come in handy in certain situations like very remote areas in which there’s no good phone signal and their highly portable size makes them ideal for outdoor adventures. Showing off an ergonomic design, these little walkie-talkies can be firmly gripped for your comfort. For added convenience, Floureon includes a belt clip to attach the 2-way radio and access it more quickly. The user experience is improved by an LCD backlit display that can show the battery level. These walkie-talkies offer a 22 channel PMR system which is really not complicated to use, but quite fun actually. The frequency range is decent considering this is still a toy and Floureon made lots of adjustments for obtaining a good level of audio quality. In terms of loudness, there’s some room for improvement, another notch or two of volume would have been perfect but still, it does a great job all things considered. The pair of transceivers works with six AAA batteries (three for each unit). 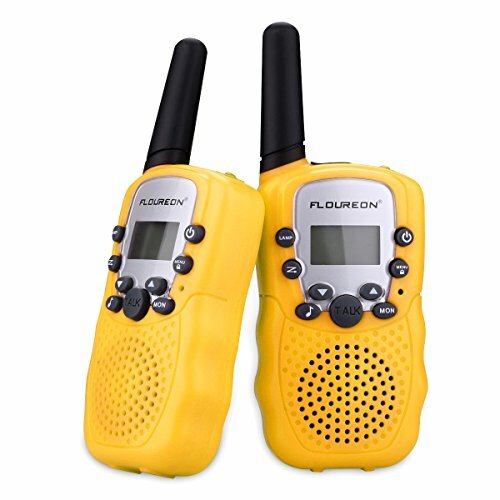 Floureon designed very portable 2-way radios that kids can safely enjoy and you can rest assured when you’re at the supermarket or a festival and don’t want to lose the ability to instantly reach your children. Overall, this is a great choice for a minimal investment that’s sure to add some fun in any outdoor activity. 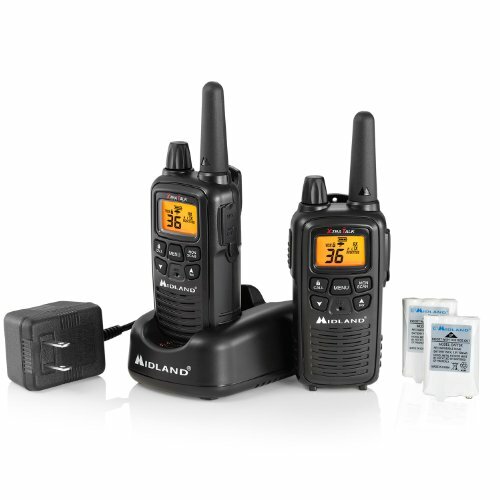 This unit by Midland is a solid choice for a walkie talkie providing a large range and access to NOAA weather alerts. With a generous selection of channels, this unit has lots of great qualities that radio enthusiasts will appreciate. From the multitude of channels added in this model, you can get access to FRS and GMRS frequencies. The former have shorter ranges than the latter, but their primary advantage is that anyone can use them as opposed to the GMRS frequencies which will require a license. It scores well in range tests exhibiting superb clarity within a mile though the quality starts to decrease bit by bit after 1.5 miles. This two-way radio offers some interesting emergency features. Besides the handy weather alerts, you can also send a loud distress signal thanks to the SOS siren button. An option for automatically scanning local channels is also present. Midland created a very useful radio for outdoor adventurers in case they get stuck or lost somewhere with poor phone signal. GXT1000VP4’s weight is about average but it feels durable in your hand. This seems like a product intended to be taken in the wilderness but unfortunately, Midland only equipped it with a JIS4 rating for water resistance and didn’t make it fully IPX7 waterproof. An alligator-style clip has been included in the package for easing the attachment of the radio to various body locations. Aside from that, Midland provides a rechargeable battery with a charging pack. In case you don’t have access to a power outlet, there’s also the option to use four AAA batteries. A noise-canceling feature would have been nice for this kind of walkie talkie but considering the affordable price, it’s still a very strong investment. If you want a reliable, durable two-way radio which comes loaded with handy features then you can count on the Midland GXT1000VP4 to provide effective communication everywhere. 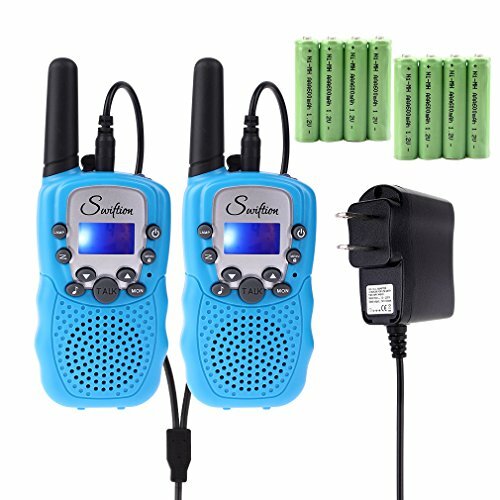 Sokos makes some quality walkie-talkies for kids and the reason they are worth the money is that they are incredibly simple to use, offer a super long play time, and the sound quality is very crisp and loud. They can be the ideal gift for any children as they provide endless fun with fast reliable instant communication everywhere. A powerful PMR system with automatic scanning functionality has been integrated by Sokos as well as many unexpectedly potent features for what’s essentially a toy. There’s auto squelch for eliminating background noise, a built in flashlight to signal your presence in the dark and an intelligent alarm system. The latter can also help with the real-time monitoring of your children to keep them from wandering off too far. The design has been refined with a modern touch and the manufacturer tried to create a very portable and compact little device. Its audio quality is pretty smooth and the adjustable volume level works well. The battery offers 3.5 hours of continuous action and up to 9 hours in standby. Sokos walkie talkies need 3 AAA batteries to get powered up. On the back-lit LCD display, you can check the level of charge. With a simple touch of a button, the PTT key, you can talk through the built-in microphone immediately. Keeping in touch with your friends and family is amazingly easy. You just need to stay within the walkie talkie’s range which is approximately 3 miles and can reach up to 5 miles in an open field. There’s also the ability to broadcast to multiple units or to use different channels. In fact, Sokos provides 22 channels for your convenience. 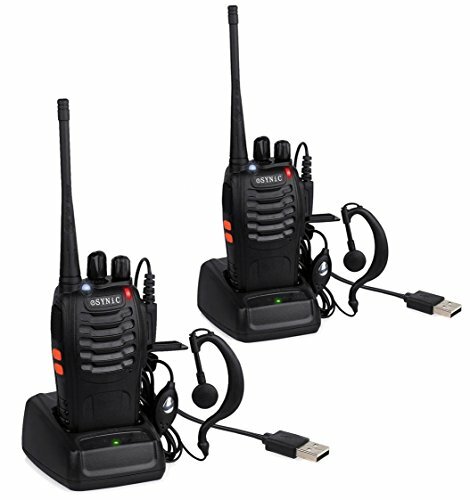 In conclusion, the walkie talkies from Sokos are a good solution for communicating over short distances. Their compact design, great features, and reasonable price earned them a full recommendation. You’re getting more than just a toy, you get a truly stylish and useful device for your kids. 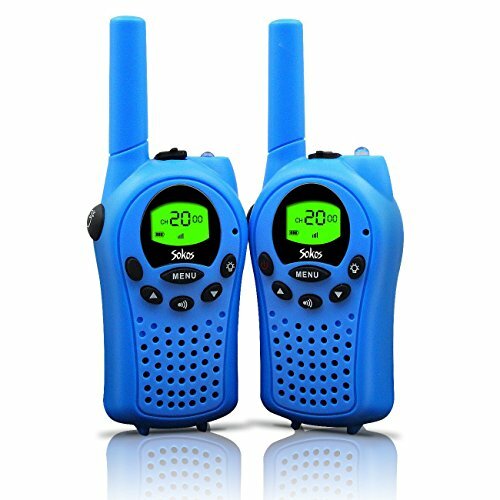 Finding the best walkie talkies for your particular needs is a bit difficult as you can get lost in complicated technical specs which may not mean much to someone who’s not that familiar with these radios. ESYNiC’s walkie talkies are very simple to use and practical in many situations. By choosing them, you’re making yourself a huge service as they deliver superior performance for their price. 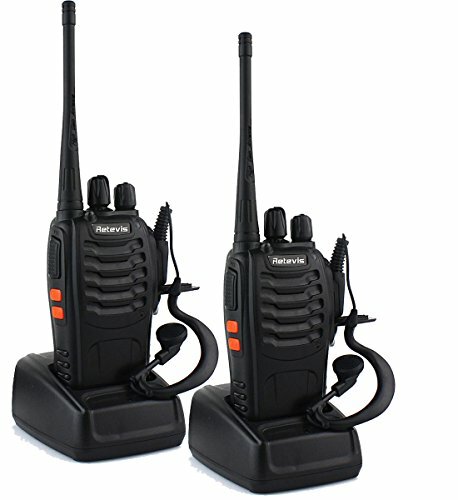 These two radios are able to connect with each other in many areas that lack phone signal like very remote areas. Finding your partner is easy as long as you stay within 5 kilometers. Using cutting edge technology, it ensures a high level of convenience to connect the walkie talkies. All that’s required is to turn to the same channel and a basic selection to choose from (16 channels in total) has been provided. The radios are equipped with a led light for taking them out on a dark night. A built-in clip can help with keeping the walkie-talkie secure to your waist making it much easier to carry. For charging this unit you’ve got two options, either with radio or with battery. Some battery saving features are included and the battery has a good 1500mAh capacity. Other notable features of this ESYNiC radio device would be the scanning and monitoring functions, the English voice prompt, and the 50 CTCSS/105 CDCSS. Designed to be non-slippery and with portability in mind, this walkie talkie is easy to hold in your hands and feels comfortable as it’s very light and small. The package contains useful accessories such as earpieces for private communication, the battery pack, and chargers as well as two antennas for improved range. Considering all that’s been said about these ESYNiC walkie talkies, the verdict is quite clear. This is a solid product in all regards and can be used reliably anywhere without requiring advanced knowledge. Another great two-way radio from Midland is the LXT600VP3 which comes in a compact size and with plenty of features for the price. Its popularity is mostly due to a very generous range of 26 miles (30 miles on an open field) and the high number of available channels – 36 to be more precise. Designed to fit in many kinds of outdoor environments, the LXT600VP3 seems to be intended for the more adventurous type as it can provide reliable and durable communication in remote zones. Thanks to the useful weather monitoring function, you are able to easily tune in and hear all about the latest local weather news. The performance is up to par with similar walkie talkies in this price bracket, the clarity of the transmission is really impressive up to 1 mile after which, the quality starts to degrade a bit. But still, overall it is capable to deliver good audio quality over long ranges. Besides the 36 channels that Midland put them to be used, the unit has some solid privacy settings to keep connected with your group. Other useful tidbits are the noise canceling, keypad tones and locks and the handy channel scanning feature. Maybe full waterproofing would have been a nice addition, but this radio has an acceptable level of water resistance which is good for general usage. Packed with features, it relies on rechargeable battery packs but can also work with AAA batteries in case you aren’t able to connect it to a charger. A backlit screen displays all the relevant information needed like how much battery you have left and certain notifications. Speaking of notifications, this Midland walkie talkie can provide weather alerts using the NOAA Weather Alert Radio frequencies. But that’s not all as it can also offer emergency warnings for wild fires or any other kind of disaster that happens in your area. The SOS feature is not present though, so this could be considered a small drawback. This unit is a decent choice as it offers pretty much everything you’d need from a walkie-talkie. Its intuitive design, great clarity, and the comprehensive amount of features recommend it as a very high-quality radio that will bring an instant reliable connection wherever you go. Walkie talkies have become extremely popular among children and many companies have offered interesting options but not all of them are really worth their money. Swiftion’s two-way radios seem to belong to the limited categories of this kind of devices that are truly worth making the investment. Working flawlessly right out of the box, these walkie talkies will bring a lot of fun for your kids though they are also suited for adults. 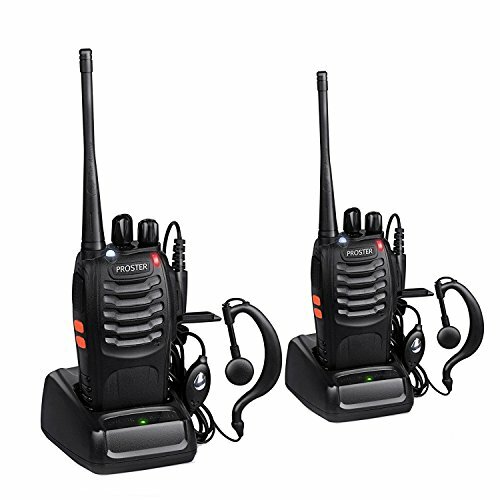 Designed with 22 selectable channels and a large wireless communication range of approximately 9000 feet, the Swiftion walkie talkies create a very reliable connection without compromising on flexibility. A very useful feature is the CTCSS/DCS which enables some privacy by blocking signals from other users. By setting the same channel and the same CTCSS, an interesting possibility appears. You are basically able to link more than two walkie talkies for extending the fun to the whole family. Another handy function that will be really appreciated by parents with smaller kids is called VOX. For those children who haven’t yet grasped the concept to transmit their voice when you press a button, this feature can activate the transmission without the need to press the PTT button. If you use the unit in a darker environment, the built-in torch can provide some light. For keeping the children from accidentally changing the channel, there’s the possibility to lock the device but the nice thing is that other functionality won’t be disabled. During locking you can still adjust the volume, receive, transmit, and monitor channels. Swiftion included rechargeable batteries which can be fully charged within a couple of hours and depending on usage conditions they’ll allow for approximately four hours of playtime. Checking the battery level can be done conveniently using the LCD display which also shows the channels and the scan function. The device warns you when the level of the charge gets low. Considering how fully packed with features is this Swiftion walkie talkie, a recommendation almost goes without saying. This light and portable device can be used very easily by children but even adults can enjoy its great communications ability. For the money spent, this device is one of the safest bet you can make for a capable walkie talkie for kids.